Here in Italy we’ve just celebrated one of my favourite nights of the year; San Lorenzo. Basically every year on the 14th August as soon as the sun goes down people flock to the beach laden with alcohol to have a bonfire, often accompanied by a DJ and an amp! 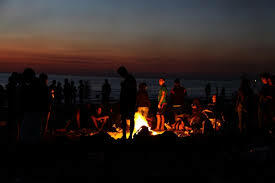 The night is then spent drinking, dancing, chatting around the bonfire and lying on the sand watching the sky. Why? Because San Lorenzo is the night of the shooting stars where for some logic that I’ve never quite understood you can see hundreds. As me and my husband stared at the sky making wishes I started thinking about the difference between Italian and English. In Italian a shooting star is called “Stella cadente” which translates as “falling star”. This is a million times more beautiful than the english shooting stars which implies urgency and probably a little violence. Falling stars sound romantic and beautiful, much like the Italian language itself. It got me thinking about all the Italian translations which are so much more poetic or emphatic than their English equivalents. “Boh” is one of my favourite words or, more accurately noises, that lacks an English equivalent. Quite literally it means “I don’t know” but it also means “what are you asking me for? I have no clue and I’m surprised that you think I would be the person who would know the answer to this question.” It just doesn’t translate. In second place is “Allora” the word which fills every gap in conversation and preludes virtually every sentence. It is a mixture between “well” and “so” and “then” but it rolls so beautifully of the tongue. What are your favourite Italian phrases? Leave me a comment and let me know. This is exactly what I mean about the beauty of Italian words, we just don’t have it!